With the new craze about Adventure Vans, you might be wondering— what exactly are Adventure Vans. Read up about them here. 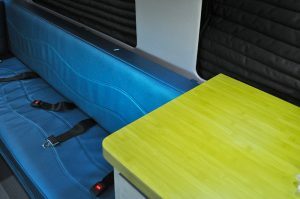 Check out how these clients embraced their inner colors through the interiors of their Sprinter Vans. SEE HOW 6D HELMETS — USED $10,000 TO FULLY CUSTOMIZE ITS NEW SPRINTER VAN – TURNING IT INTO A MOBILE OFFICE AND WORKSHOP TO — USE ON THE ROAD, IN TRADE SHOWS AND AT MOTOCROSS RACES AROUND THE COUNTRY.